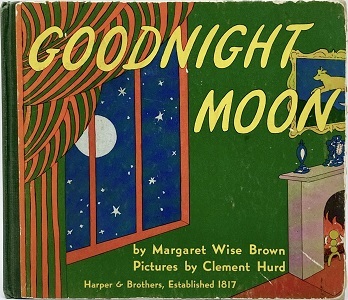 Goodnight Moon by Margaret Wise Brown and illustrated by Clement Hurd is one of our "rotate regularly" books. These are the books that we need to hide for a week, every so often, just so we don't get driven demented reading them over and over and over again. And again. And again. You get the picture. It is a firm favourite of Felix's and he will even request numerous readings in succession which is rare. It is a simple story of a young bunny's bedtime routine of saying goodnight to the things in the bedroom. It is very effective at creating a bedtime atmosphere; as you read the book you hardly notice that your voice lowers and you read the text slower until you are whispering the last line. There are lots of little details through the book that contribute to that effect; the clock progresses from 7pm to 8:10pm, the moon rises from the lower left corner of the left window and the lighting in the room grows progressively darker. There are lots of other tiny details you come to notice after multiple readings; the tiny mouse is present on every colour page, moving about the room until on the final page he has eaten the mush, the book on the nightstand is "Goodnight Moon", and the painting on the wall in the painting of the three little bears is of the cow jumping over the moon. There are so many way to expand this book into something more than just a simple story. Felix and I love to play "find the mouse". We go through each colour page and it's Felix's job to find the mouse. As soon as he points to it I squeek like a mouse. Well, in fact, it's absolutely nothing like a mouse, but I squeek in the most fun way possible to elicit maximum giggles. Possibly not conducive to a relaxing, sleep inducing atmosphere but sometimes fun just has to take precedence!! I like to think of the mouse as a precursour to Goldbug. I hope you take the time to introduce this book to your child. If you do or if you already have I would love to hear what reception it got.